A plaque depicting Alfred Nobel at the Nobel Peace Prize ceremony held in Oslo, Norway in 2015. A trio of scientists from the U.S. and the UK have won the Nobel Prize in Chemistry this year for using evolution to their advantage, developing new methods of creating molecules that have already helped us produce safer, greener chemicals and new drugs. The prize was awarded to Frances Arnold, a professor of chemical engineering at the California Institute of Technology; George Smith, a professor emeritus at the University of Missouri; and Gregory P. Winter, a genetic and protein engineer at the M.R.C. Laboratory of Molecular Biology in England. 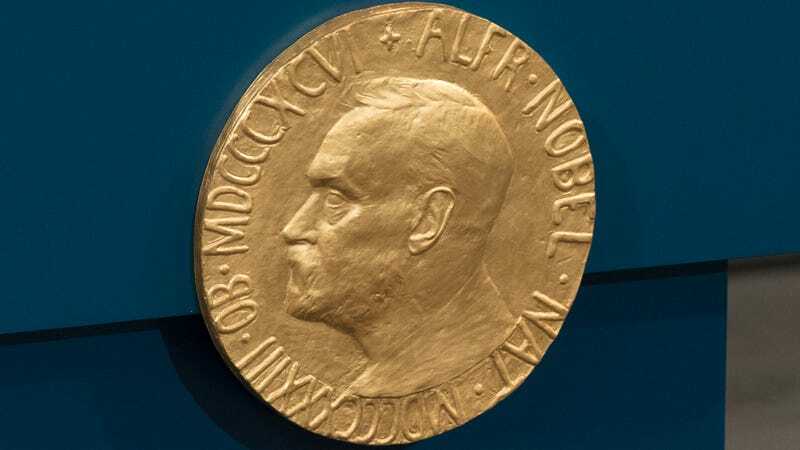 Arnold, who is the fifth woman ever to win a Nobel Prize in Chemistry, received half of the $1 million award, while Smith and Winter split the remainder. “This year’s Nobel Laureates in Chemistry have been inspired by the power of evolution and used the same principles—genetic change and selection—to develop proteins that solve mankind’s chemical problems,” said the Royal Swedish Academy of Sciences in a statement announcing the prizes. Arnold was awarded the Nobel for her pioneering work with enzymes, the proteins that act as catalysts to speed up other biochemical reactions. In 1993, she became the first scientist to prove that you could directly guide the evolution of enzymes. She created random mutations in a certain enzyme’s genetic code, producing new variations of the enzyme, then selected the variations that produced the effects she most wanted—such as breaking down a milk protein. Her process has since been refined and used by herself and others to create more environmentally safe chemicals and renewable fuels. Smith and Winter were awarded for their work with bacteriophages, the viruses that feast on bacteria. In 1985, Smith was the first to show that phages could be used to manipulate the evolution of new proteins, a method known as phage display. Winter then used phage display to evolve new types of antibodies that could act as drugs. These drugs—the first of which were approved in the early 2000s—are now routinely used to treat advanced cancers and autoimmune disorders and to counteract toxins. But even these real-world applications are only the beginning of what scientists could create using directed evolution, according to the Royal Swedish Academy of Sciences. “We are in the early days of directed evolution’s revolution which, in many different ways, is bringing and will bring the greatest benefit to humankind,” the organization said. This article previously misspelled Frances Arnold’s name. We regret the error.